Faith No More guitarist Jon Hudson says he’s already working on new material. The band released Sol Invictus last year – their first album in 18 years. And while Hudson didn’t write any of the latest material, he says he has a few things up his sleeve that he hopes will see the light of day sooner rather than later. Hudson tells FNM Followers: “I am working on a few ideas right now. It’s something that I wanted to focus on after the tour ended, so it’s a good place to be in. I’ll probably take stock and see what comes of it sooner rather than later, so we’ll see. “I’m sure that I was the first to state in the press last year that I didn’t bring any songs to the table. By the time I became involved in the process, there was already plenty of material to work with. 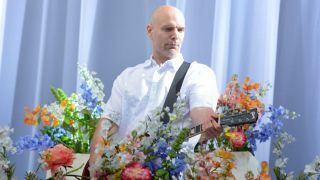 Hudson also says that none of the material he and bassist Bill Gould worked on during FNM’s hiatus made it on to Sol Invictus, and he doesn’t foresee the pair going back over that old ground. “Nothing from that time period ended up on the album,” he says. “I’m glad we worked on it, regardless of the outcome. We put together a batch of songs that had potential, but the project didn’t develop much beyond that, so we shelved it and that’s where it belongs. Faith No More will re-issue their 1985 album We Care A Lot on August 19 via Koolarrow Records.